There will be an U17 pre season training session this Wednesday the 2nd Aug. Please make an effort to turn up I know some of you are on holiday. Lets have a good turn out!!! New season still seem a long way off? Reduce the effect of those rugby withdrawl symptoms by reliving the highlights of almost all of England's Six Nations campaign at SportUK.TV. This free website - officially supported by RFUW - has recently been redesigned and gives video highlights of all of England's home games, as well as most away fixtures. So not only can you see the best of the two victorious days at Old Albanians (with the additional bonus of playing "spot the Letchworth ball-girl"), plus also catch the highlights of England's wins at Murryfield and Paris. Although we may have some training sessions before then (especially the U17s) the season officially starts on Sunday 3rd September and the most important feature of that first Sunday will be Registration. 1. "Parent" Aged co-habitant of your home. AKA the "free taxi service". Notable for their unaccountable obsession over things like tidy bedrooms. This is the only weekend when you really do have to bring them along with you, and they can leave as soon as they have signed various documents which are kind of important as without their autographs on the dotted line you can't play. Or even train. Simple as that. So on the 3rd remember - parent! Don't leave home without one! 2. "Membership fees". £60 per year, or £5 per month - with very significant reductions available if you have brothers or sisters who are also members. Can be paid as a one off amount or as a monthly standing order. At just over £1 per week this is a staggeringly good deal by the standards of pretty much any sports club anywhere - but more importantly if you don't pay up you're not insured!!!!! This means that if you were to get injured, or more importantly if you were to injure someone else, it could get quite expensive. Including for you. Note: new players will obviously have a few weeks grace, and if you pay by Standing Order and later leave then obviously you can cancel that order. 3. Photographs & ID cards. All boys who play rugby have always had to have RFU ID cards with the photograph, age etc. 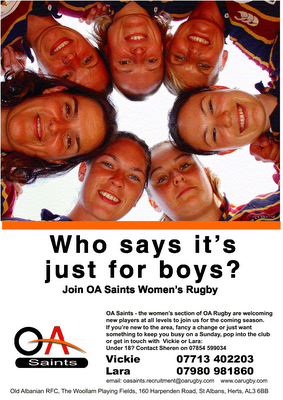 - but this has not applied to girls as RFUW do not run such a scheme. However last season there were occasional questions raised about how old some girls were (especially in some of our U14 opponents) and so, to ensure that at least we are covered, the club has decided to extend registration to the girls teams as well. So you will need to bring with your two photographs. If you don't then hopefully Mark may be around to take some - but you will then have to put up with whatever image emerges. This ends the first reminder. Please make appropriate notes on your calendars/diaries/mobile phones. Now. Due to a lack of intrest there will be no U17 pre-season training this Wednesday the 26th July. There is very little you can do with a turnout of 4-5 people. All under 17s need to read the email I have sent out dated 24th July. If you havent recieved this please let me know by emailing me through the link below. Congratulations to several girls from the club who picked up awards or commendations at Highfield School's first sports award evening on Wednesday. I haven't got a full list of those whose sporting exploits were recognised, but I understand that Nikki, Carla, Ruby, and Nichola all received recognition (though apparently Carla's was for - bizzarely - rounders, apparently). If anyone else was recognised please tell me! However highlight of the evening was the first award of Sportswoman of the Year, complete with glittering glass trophy, which went to Hayley Guilder. Quite sensibly Hayley was not allowed to walk off with the actual trophy, but she did get a smaller version to add to her growing collection. No pictures - yet - but if we get some they will be added. Remember this picture of the U14s, which Rachel took at the Sevens in May? Well you could be seeing a bit more of it soon. As reported below Rugby World were rather taken will our poster designs and will be featuring them in the next issue. However one of the magazine's main designers - having seen the posters - was so impressed by the above image that he has asked for (and we have supplied) a high quality copy of it for use in the October issue (which, confusingly, comes out in the first week of September). This won't be used to just illustrate an article (unlike our last appearence) but will be used just because its a good quality image in its own right. So is unlikely to be buried somewhere in the club pages and will almost certainly appear more promiently in the magazine - even perhaps (depending on whatever the main features are - and the Women's World Cup could be one) the cover. News about this news 'blog is making the news itself. If you follow me. Yesterday, at a little after 3pm, the site had its 2,000th visitor - and today the RFUW published an article about it (see here). 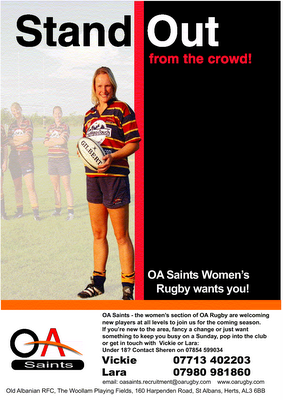 Since then its also been picked up on other rugby news sites, and is likely to appear in the next Rugby World (along with something about the posters - even our publicity is getting publicity!). Chances are there will also be coverage elsewhere - so watch the pages of local newspapers, rugby magazines, etc. Did someone once say that girl's rugby didn't get much coverage in the press? Under 17 Pre season training starts again this Wednesday 19th July 6-7pm. Similar to the last two sessions we will do some circuit training and then a game of touch to finish off with. Although these sessions remain non-compulsary it would be good if we could begin to get the majority of the squad back in training and working together so we can begin to set our goals for next season. The sooner we get the majority back in training the better prepared we can be and the higher the chance of winning some silverware next season. So lets have a good turnout please!!!!!!!! A long warm day at Hatfield ended in ultimate triumph at SuperTeams 2006. A combination of "Its a Knockout" and "SuperStars" this was the second time some of our girls had taken part. Last year a team with Nichola, Hayley and Carla in it had lost out by a single point, but this year it looked like we would be even more unlucky as the results were announce and Nichola's U17 "B" team missed out on third place (and £75) by half a point. For a while then it seemed the most memorable feature of the day would be the way Nichola's "only here for the craic*" combination had done so much better than Joe's all star U17s (including Nim, Katie, and Chloe), who finished up rather further down the list. 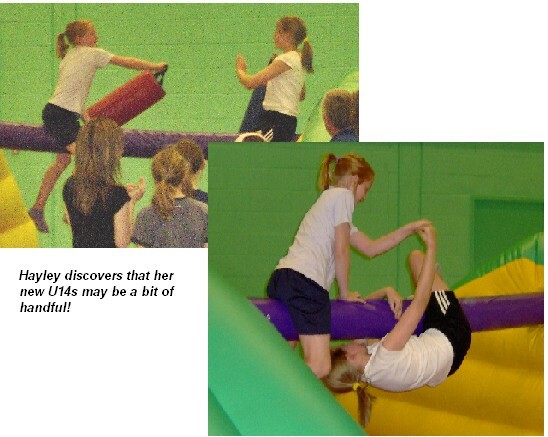 Nichola's party-people had even beat Joe's team on the gym tests! But this inter-U17 rivalry was all forgotten when it was announced that Fern Glenister's U14 team (aided by Harriet Long, Hannah Reynolds, and Graham Birch) had won the "Fair Play" award... and £250! Hayley Aldridge also coped well with her first experience of captaincy, though her team (which included new U14s Becky and Laura, as well as Becky's brother Stuart) never recovered from a poor performance "joker" event. All in all it was a fun event with several memorable performances. 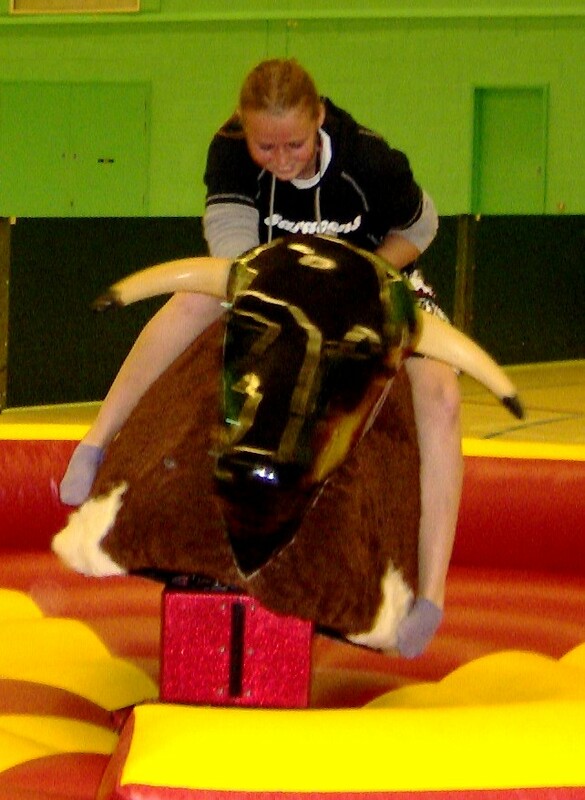 Nichola showed fautless class at basketball, Hayley and Fern triumphed over the bungy run, one of the U14s stayed on the rodeo bull right to the end (sorry - I can't remember which one! Let me know and I'll edit this), Katie showed why she doesn't play much hockey anymore, Joe showed why a career in wild west rodeo might not be a good idea, and Hayley found her new team-mates a bit of a handful on the joust - though perhaps Fern and Nim battering each other to a memorable draw on the same equipment, each giving no quarter, was probably the highlight of the day! In the end then a profitable day, and a good way of introducing several new faces to the club! *[Craic: From Irish gaelic - means fun, experience, good time. Nearest English would be "Here for the beer", but that would not be appropriate as a) you're not old enough and b) there wasn't any]. 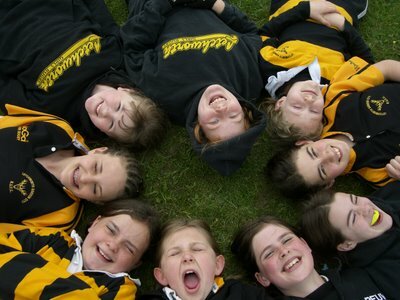 Girls' U14 Schools tournament - will YOUR school be taking part? Ask your PE teachers NOW about whether your school will be entering the first Girls U14 "Emerging Schools" tournament next year. And if not (or if they don't know) ask them why! The competition is not aimed at schools that have been playing for years - but at new schools offering the game for the first time (hence "emerging"). Herts Sports Partnership will pay for coaches to come in and help out (so the any excuse like "I don't know how to play rugby" or "I'm not qualified to coach it" from any PE teacher isn't good enough!). 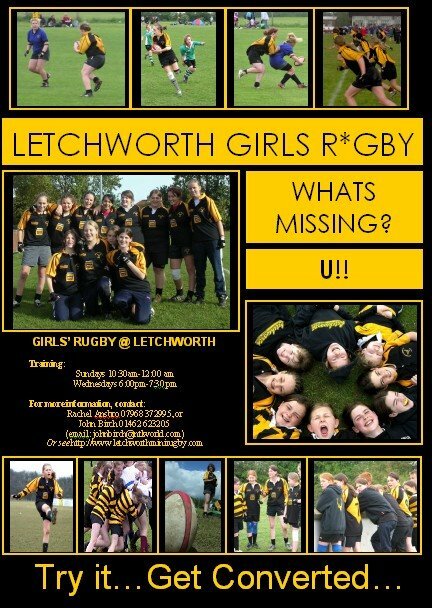 Letchworth's coaches will also help out where they can, and we are even going to get Katie, Nim and Steph trained up as qualified coaches by mid September - so there should be no excuses from Highfield, Fearnhill or JHN!! The final is at Twickenham in May, but before that there are district tournaments planned in the Autumn, a county tournament in February, and a regional qualifier in March. So start badgering your teachers now - before they've finalised their plans for next term (September will be too late). Tell them how great it will be when they lead their school out onto the pitch at Twickenham. There are a few more details on the county blog. ...beyond saying that I didn't write this and do not bear any responsibility for the content. Based on all your responses three of the five posters designs are going to be printed. 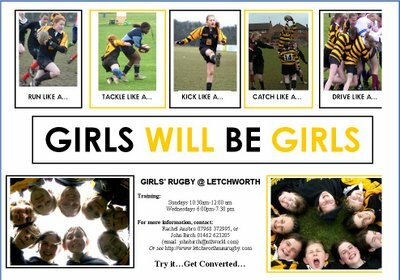 This in addition to the "Girls will be girls" poster which came out last week and will soon be appearing in a library near you! The "winning" designs were: "What's missing? "; "Who says..."; and "No question"
Various sizes will be available (A5 to A3). If you can use some please let me know. And - to answer a repeated question - most of these designs are work of the (soon to be internationally renowned) Sasha Acheson Design Studio. Grab 'em while you can - could become collectors items! The RFUW are offering some rather neat car stickers with the slogan "Six Nations Grand Slam Winners 2006" on them and (in slightly smaller type) "Next challenge: Women's World Cup Edmonton". Both are - it seems - free (the RFUW's latest mailing doesn't actually say one way or the other). There will not be any Under 17 pre season training this Wednesday 12th July. Under 17 pre season fitness training will recommence a week Wednesday on the 19th July. You know - this one - the one that caused such an "emotional outburst" from on of New Zealand's toughest rugby players? 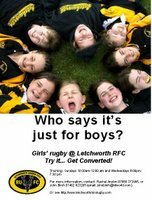 There is a summer rugby course being run (at Hichin) during the summer, it is for girls and boys aged 8-13. It could give you a chance to improve your skills over the summer or to encourage friends to try the sport out before they join the REAL players next season. It is for beginners and experienced players. The course is being run the week of 31st July between 9.30-11.30. The cost is from £25.70 for the course. More details can be found in the Summer Zone brochure. Also I want to plug my service that I run over the summer, this one is free and is play sessions (so suitable for all) in local parks and recreation grounds across the district. Sessions are open to any children aged between 5 and 13 and there will be a number of sports available to play as well as arts and craft activities. 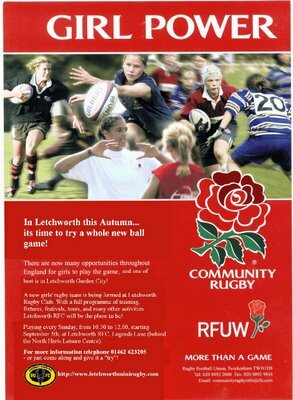 Letchworth sessions include.... the Grange Rec, Jackmans Rec, and Norton Common. other sessions include, Walsworth Common Hitchin, Ashwell Rec, Ave Park Baldock and many others, if you need more info then please contact me. If I dont see you, enjoy the summer and I'll see you in Sept. I know that from time to time some of you feel that you are a bit marginalised by the wider club - reponses to surveys on Nikki's website (all be it with slightly leading questions) indicate that - but truth is that the club does think quite a lot of you all, and is indeed rather proud about what you have achieved in the past couple of years. Okay, not entirely PC on the terminology, but still pretty neat. 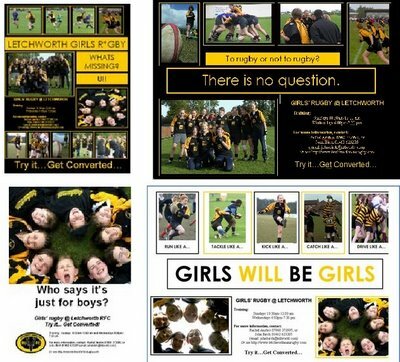 The junior/mini report also gave more coverage to you lot than any other section (admittedly this was partly due to a misunderstanding over what was meant by "short report", but it still could have been cut), and the development of girls' rugby remains one of the clubs main published priorities. It looks like we will have four teams in the SuperTeams competition on 16th July. You will note that both "B" teams have potentially five members... that gives us a bit of flexibility if someone can't make it. If we do end up with too many we will try to ensure that the "extra" person is fully involved! Hockey Skills: Relay for all four team members. Dribble a ball through cones, shoot, score a "goal", return. Fastest time wins. Rodeo Bull: Two members of each team try to stay on the bull as long as possible! Basketball: Each team member dribbles and shoots. Most baskets in two minute wins. Football speed test: Each player has three kicks, which are measured by a speed gun. Total speeds added together. Gym test relay: Each team member does six sits ups, runs through a "two feet ladder" exercise, then throws a bean bag at a target. Best overall time wins. Each team also has a "Joker" to play which doubles their score in a chosen event - but the Joker has to be played BEFORE the event! The swimming pool is also open, as will be the climbing wall. Spectators (including parents) can also use the pool! Medals, etc. - plus £250 for winning teams, £125 for runners up, and a £250 "Fair Play" award. See you on the 16th. If you need transport please say so NOW! One more design... keep the comments coming in! Another proposed design - what do you think? So far the "No question" design is a clear leader, with some support for the "Get stuck in" and "Who says..." - but keep your views coming in. The first poster has now been printed. I have 250 A5 "leaflet" versions and 25 A3 "poster" sizes. If you can make good use of any now please let me know. We now have four new designs for your views for you thoughts and consideration. Again you can get a clearer view by clicking on either poster. I don't think we can reasonably do all four - we already have the earlier "Girls will be girls" in production, so I suggest we target two of these designs for now. Before making up you mind its important to think about what they are for. We are not just looking for good designs (they are all that), but designs that hit and excite the target audience - ie. 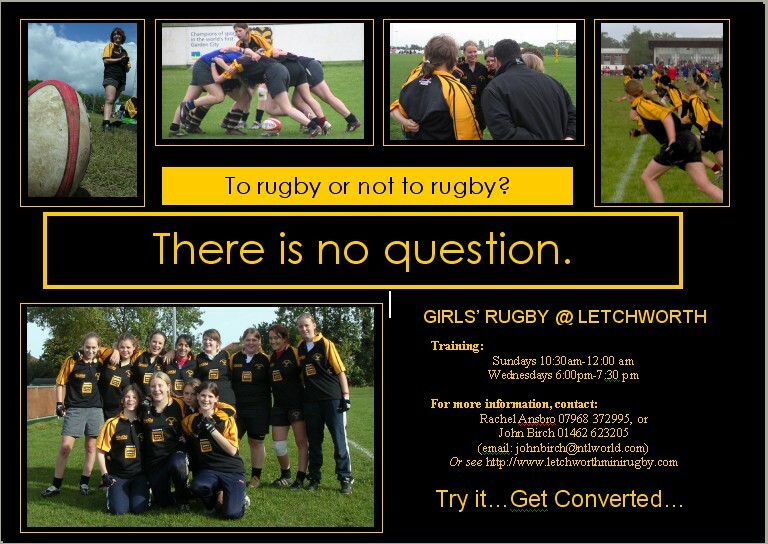 girls aged 10-13 with no previous rugby experience. 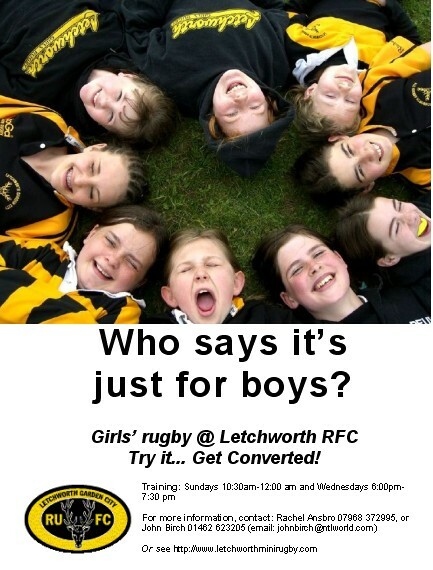 So a poster that just says "come and play rugby here" won't really work as they don't know they want to play rugby yet! What we want is something that says "come and have a great time". Anyway. Four designs - votes please for two of them. 4. "Get stuck in"... setting the challenge. You can vote using the comment link, or - if you want to remain anonymous, or you can't get it to work, just email me. Closing date... let's say 17th July? Two festivals for U14s in October! Our U14s will have their most challenging start ever with exciting news that Beckenham Festival will for the first time include a U14 competition as well as the usual U17 event! As in previous years it is emphasised that this will be a "development" event, so slightly simplified rules (details expected later). Beckenham RFC are clearly trying to build up the competition, which had a smaller than expected entry last year, and are sending invitations to clubs across the region this week (all clubs who took part in Herts 7s are likely to be contacted). Just a reminder to U 17s that there is NO fitness training this Wednesday 5th July as various people (including me) are otherwise occupied. Sasha's poster design has been accepted by the powers-that-be and will shortly start appearing on notice boards across the area. But we need more than one design - so is there anyone else out there who wants to show their artistic skills, and win a bit of fame and fortune? To give you a few ideas take a look at three apparently quite succesful designs - two from OAs and one from RFUW. Obviously we are not looking for exact copies of these, but they might spark of a few ideas. Obviously the OA posters in particular are aimed at adults - but would the ideas work with girls (do they work for you?). The main target is girls aged 11-13 who have not previously played rugby, and may know little about the game. What would attract them to come and give it a go? What do you enjoy about the game - how could you capture than in an image? Note that any pictures you use have to be "ours" - ie. 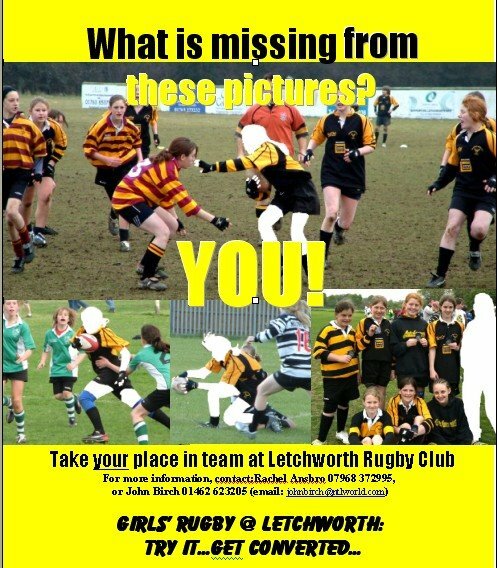 taken by someone associated with Letchworth RFC. We cannot use pictures from RugbyMatters or the local press (well, not without paying them - possibly quite a lot). Also ideally we want these to be printed and ready to go for September (if not late August)!